Joe Bergeron grew up in the twin hamlets of Endicott and Endwell in upstate New York. As a boy he taught himself the constellations using a cardboard star wheel, watching in awe as stars he had never before identified rose according to prediction. Later he began a more thorough examination of the heavens using various small telescopes. A devoted hiker, Joe prowled his surroundings at all hours of the day and night, often discovering semi-abandoned sites of human activity which his imagination invested with the mystery of ancient ruins. Joe was known as a "class artist" in high school, mostly by virtue of superhero drawings done in ballpoint pen. His early efforts at painting were clumsy at best and disastrous at worst, leading him to be intimidated by the brush. Finally, called upon to produce planetarium shows during a summer job, Joe taught himself to paint so he could create visuals for the shows. Soon he was selling paintings and drawings at science fiction art shows, winning a window full of awards in the process. Later he broadened his artistic skills by getting a degree in studio art from Binghamton University. He eventually illustrated various science fiction books and magazines, including titles by Isaac Asimov, Piers Anthony, and James Tiptree, Jr. He also served as director of the local small planetarium. For three years Joe worked as staff artist at Morehead Planetarium in North Carolina. For a while afterward he continued to illustrate their shows, though at a distance as a freelancer rather than as an employee. Joe's restlessness eventually led him to make a series of trips to the West, a landscape which has fascinated him since his first visits there as a child. He spent a summer as a volunteer in Zion National Park, where he used his telescope to acquaint park visitors with the glories of the desert skies. Later, while living a semi-hermitlike existence in the Mojave Desert, he was tracked down by Time-Life books, spending the next few years producing illustrations for their ambitious book series Voyage Through the Universe, depicting subjects as diverse as the rings of Saturn and experimental space tethers. Joe then returned to the gentle hills of the Endicott area for several eventful years. But the West continued to call, and after several false starts, Joe girded his loins and migrated to an obscure part of the southern Sierras of California, where he worked for many clients, spending his summers among the cool green hills of upstate New York. After several years of being a Westerner who spent a good part of the year in the East, in 2003 Joe returned to pastoral New York to try life as an Easterner who spends a good part of the year in the West. At the very least, Joe tries to attend the annual Grand Canyon Star Party, during which he talks to more people than he does during the entire rest of the year. Joe also serves as an Astro VIP for the National Park Service, offering insight on the night sky to park visitors and amusing them with his green laser pointer at parks like Capitol Reef and Glacier. With the market for original illustrations drying up, Joe now works primarily as a painter, creating representational works in oil and acrylic. His other major interest is writing. He's completed ten novels, all available for sale. Also available is Cosmic Cat, a children's picture book offered in print and digital formats. Joe's artwork is richly influenced by his decades as an amateur astronomer. He attends star parties all over the country, though most often he can be found out alone on clear nights, either somewhere in the desert or in some grassy field. He has been privileged to see the sky painted in bold colors by the aurora borealis, the glory of the solar corona during eclipses, a golden star flickering behind the rings of Saturn, pepper-black spots deposited on the clouds of Jupiter by a rain of comets, and light streaming like water from Comets Hyakutake and Hale-Bopp. Joe stood enthralled as meteors poured from the mane of Leo in 2001. He's even managed to spend a couple of months in New Zealand, where he had the views of the far southern sky he'd always craved. 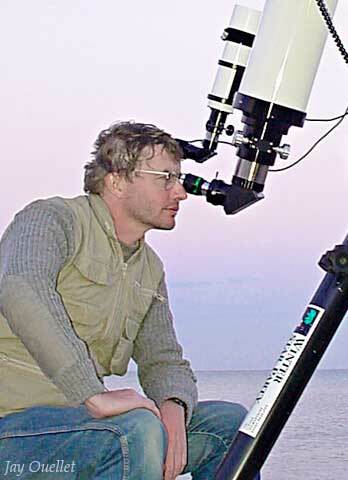 Joe is a Fellow of the International Association of Astronomical Artists. Joe finds himself in the uncomfortable position of being a cynical romantic. The beauties of the night sky and the natural world are his best solace. For several years he has worked at developing a looser, more spontaneous painting style to complement the tight, precise techniques he uses for his space art and other illustrations. His work is not restricted to space themes, but includes portraits, wildlife, landscapes, fantasy, and figures. His artwork, past and future, blends his love of astronomy with interests in nature, mythology, and archaeology. Need more pictures of Joe for some odd reason? Check these out. Prefer straight information without gobs of superfluous prose? Try Joe's resume. Do you wish to review odd, little-known facts about Joe? Okay! Listen as I stumble my way through the Podcast interview made during Balticon 41 in 2007.